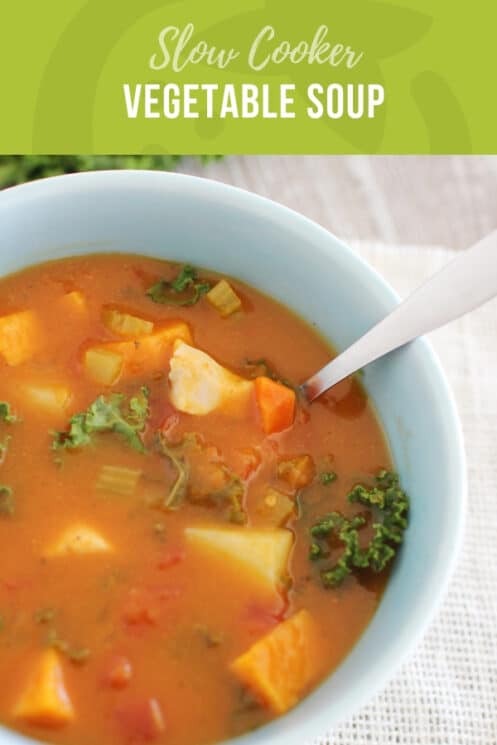 Slow Cooker Vegetable Soup is hearty, delicious and kid-friendly using our ‘kid soup tips’! Soup is a great way to get kids to eat veggies, if you do it right. 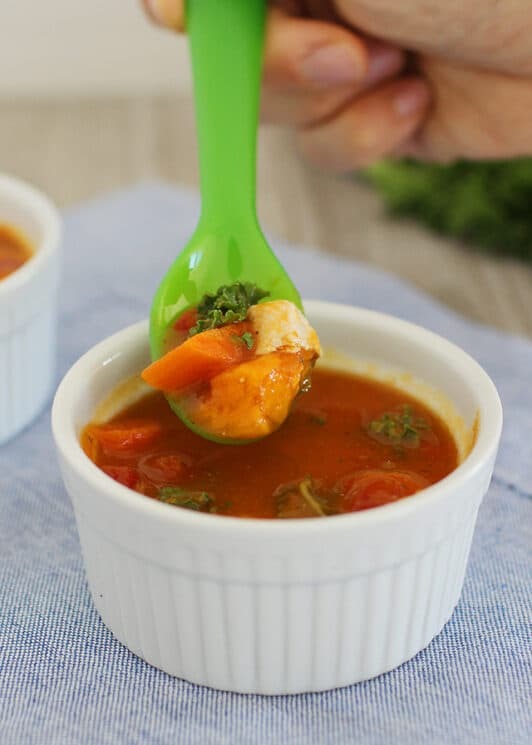 When it is filled with fun colors, and you use a few simple tricks to make it taste amazing, soup can be a really kid friendly, nourishing meal for kids. Tip #1: Use squash puree in the broth base. Tip #2: Add flavor with ingredients. Tip #3: Chop veggies small. 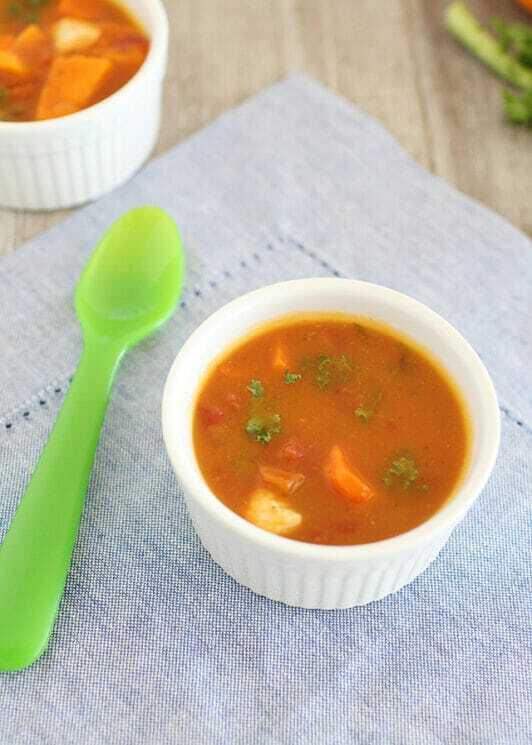 Tip #4: Puree soups for kids with texture sensitivities. 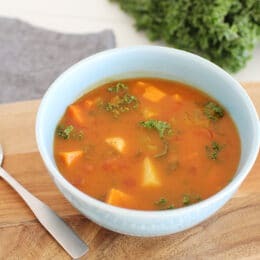 Take an immersion blender to this soup when it is done and blend the veggies until you reach a consistency that you thing your kids won’t mind. The sweet potatoes make it super creamy once pureed and it is really delicious. If they can’t handle the kale, then leave it out. 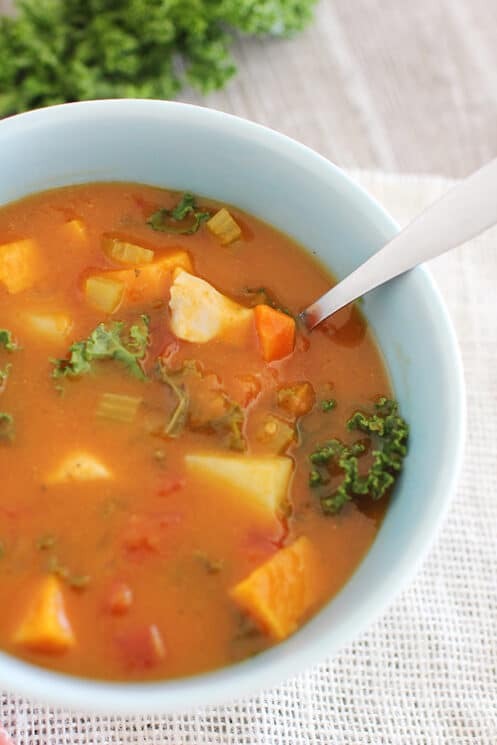 There are plenty of other veggies in this soup for them to enjoy! Pull your slow cooker out this week and enjoy the night off on slow cooker night! I even do all the veggie chopping the night before (except leave that white potato for the morning to chop since it will brown), dump it right into the slow cooker, put the lid on and put it into the fridge over night! In the morning all I have to do is put the broth and white potato in and flip it on! Done! Cooking soups in a slow cooker is so easy! For most recipes, you can just put all your ingredients right in your slow cooker, turn it on and let it cook away while you do other things. With most slow cookers, there are two temperature settings – low and high. If you cook your soups on low heat, it has more time to let the flavors combine and enhance. High heat cooking works and surely saves cooking time, but you lose a little bit of the flavor profile you can get from cooking on low heat. It is best to put your veggies in raw with your other soup ingredients so that they don’t overcook. Some softer vegetables like zucchini will need less cooking time that harder vegetables like carrots. Most any soup recipe can be adapted for a slow cooker. The major change is just cooking time and the recipe can basically stay the same as the original version. Chop onion, carrot, and celery. Peel and dice potatoes. Cut chicken into bite-sized cubes. Add to the crockpot along with the remaining ingredients; stir well. What would you recommend to make this stew vegetarian? Would it be ok to replace chicken with tofu, or would it fall apart after 8 hues of slow cookin? This looks great, thank you! I wasn’t expecting to see chicken breasts in the list of ingredients for the veggie stew — is that correct? My family enjoyed this . I had a few who did not care for the kale in it and asked me to leave it out the next time I make this (which I will do). It was a little a bland so I did add more seasoning to enhance the flavor. (This could be due to the fact that I don’t buy prepared chicken broth. Instead I make my own chicken broth without salt.) All in all, it is a very good, healthy and filling meal. Looks So Yummy.I liked your recipe very much and will definitely try it out at home. Keep posting similar recipes.Thanks a lot.